Explore the publications, spaces, and social media that connect and support the creative voices of queer, trans, and POC youth in Chicago. 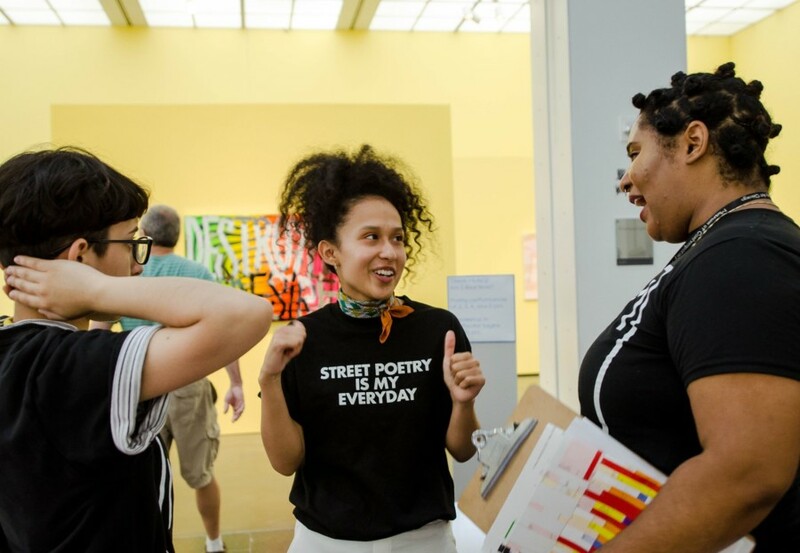 Participate in a round table conversation with local artists and activists T Munoz, Naj3e, and Ken Folk, followed by an informal hangout with tabling by zine and comics artists. This experience is developed by Teen Creative Agency (TCA) Apprentices Holden Thomas and Alexiss Villagomez. Ken Folk is a nonbinary trans, queer, Haitian artist from Texas whose visual and digital works concentrate on their existence as a Black, queer, nonbinary trans person navigating chronic illness, gender, and institutionalized racism. Their work also focuses on growing up on the internet and the bridge from URL to IRL, what it means to make art as a survival practice rather than healing practice, and the impacts of being born into mourning, loss, grief, and a body that cannot be defined without violence. Naj3e is a Black, Queer, TransFemme native Chicagoan hailing from the South Side, specifically originating from Beverly, whose overall mission with music and performance is to deliver healing, strength, self-love, and pride to other QTPOC. She wants folks to feel valued, beautiful, and confident in their identities. Within the most strenuous and challenging portions of her existence as a Queer and Trans person, the medium in which she found healing was music. She feels it is her duty to give as much as she can to others who feel the pain she once felt so they can find solace in the midst of their struggle. T is a Nonbinary, Queer, Afro-indigenous artist without any limits. They use their art as a form of resistance and protest. Most importantly, they have learned to be unapologetic about taking up space through their art. They use their art as a way to celebrate and mourn their identity. Their recent artist talk and workshop at Purdue University revolved around the intersections of race, gender identity, and sexuality. Through sharing their work with the rest of the world, they hope to find connections with folks like them. They are a strong believer in DIY and in representing black and brown queer narratives by black and brown folks. They learned this from attending open mics at the tender age of 11 and have been performing at open mics and other events around the city ever since. They are passionate in making sure Trans and Queer folks get the recognition they deserve. They will die talking about their identity. They hope their work causes audiences to reflect on how the uncomfortable realities of marginalized people can be lived through at all. While calling for action is essential, being able to be aware and breathe through pain is the first step. You can catch them getting free by spinning a set, spitting a poem, curating events with their friends, or starting revolutions in their body on the dance floor. Alexiss Villagomez is a 20-year-old queer Latinx artist from the South Side of Chicago. They mainly focus on the inclusivity of LGBTQ+ folks of color and the lack of safe spaces through curation, zine-making, and collaboration with other queer artists. They hope to become a curator and create safe spaces for young queer artists living in South Side neighborhoods. Holden Thomas is a 19-year-old trans writer, multimedia artist, and curator born and based in Chicago. Through all the mediums he works in, Thomas tells stories that explore what it means to claim and live in your body, to create a life that exists in the space between worlds, and to find home. He works to preserve queer history and stories through documentation and education.